One initial question concerns the objective of the hijackers. Is it robbery? Ransom? Terrorism? It soon becomes clear that the group, in spite of being armed to the hilt and having sequestered a major government institution, is imbued with an interesting set of morals. For they intend to neither a) kill anyone (although circumstance forces this scruple to be breached) nor b) steal as much as a penny from anyone’s bank account. They do, as it happens, intend to leave the Mint with more than one billion euros in cash. This, however, they plan to achieve by spending their eleven days holed up in the Mint printing the money they want (with the aide of the captured staff, whom they bribe with some of the loot) instead of raiding the vaults for cash that already exists. Their clever plan, therefore, is to escape with untold riches without having harmed a soul while, in the process, embarrassing the authorities and winning the sympathy of the public as “loveable rogues”. You’ve been taught to see that there’s only good and bad. But what we are doing is okay to you when other people do it – is that it? In 2011, the European Central Bank made 171 billion euros out of nothing – just like we’re doing, only larger. 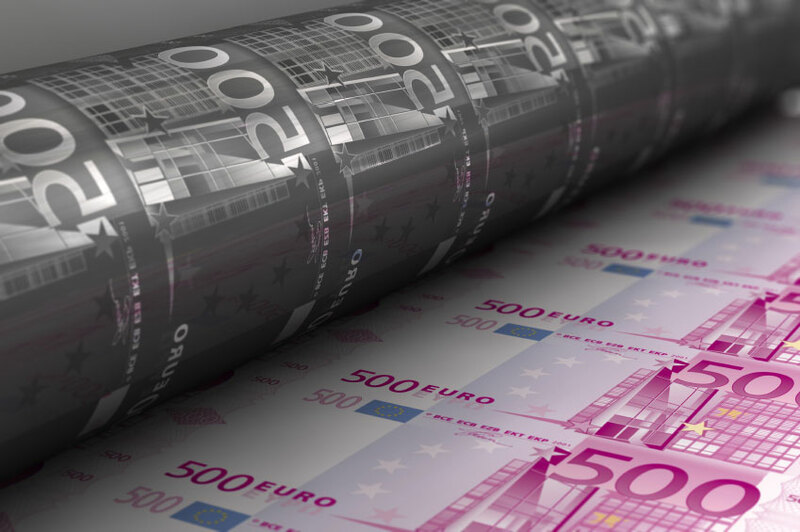 185 billion in 2012; 145 billion euros in 2013 – do you know where all that money went? To the bankers! Directly from the Mint to their pockets. Did anyone say that the European Central Bank was a thief? “Liquidity injections” they called it. They pulled it out of nowhere, Raquel, out of nothing. [Picks up a 50 euro note]. What’s this? It’s nothing Raquel, this is paper. [Tears the note]. It’s paper, you see! It’s paper! I’m making a liquidity injection, but not for the bankers. I’m doing it here, in the real economy, with this group of losers. In spite of the left-liberal agenda of mainstream film and television show production, stories that uncover the machinations of the state are not a peculiar rarity. Already on Netflix there is, for example, the popular remake of House of Cards and the TV version of Shooter, the three series of which delves deeper into state-induced conspiracies than the 2007 film. Money Heist, however, is one of the few to have addressed the issue of the state’s legalised monopoly on counterfeiting, and, moreover in such a bold manner. For not only could the quotation above have been lifted almost word for word from something written by Murray N Rothbard or Walter Block, but the equation of a major function of the state (rather than just particular state operatives who have turned rogue) with the acts of criminals is extraordinary. Indeed, it has been the libertarian message all along that criminal acts do not cease to be so simply because they are performed by the state – and that, vice versa, non-criminal acts of the state should not be criminalised if they are performed by private individuals. “The Professor” is, therefore, inducing the Inspector to realise a fundamental truth – that if he is a criminal for printing money then so is the state, or, if the state is not criminal, then neither is he. One must never read too much into the intentions of writers when they espouse libertarian themes, if only because such espousals are usually the reaction against the status quo rather than specifically in favour of liberty. Cynically, one could also suggest that the real purpose of such shows is, in fact, to soften us to the true nature of the state through entertainment rather than to provoke outrage. Yet, at the very least, it seems unlikely that the writers of Money Heist were devoid of a distinct, anti-establishment or anti-corporate state agenda. The original Spanish title of the series is La casa de papel, the literal translation of which is The House of Paper. Just as the title House of Cards indicates the weakness and vulnerability of the political system, surely House of Paper is a metaphor for the fabricated prosperity of our modern, welfare-warfare state? Moreover, a recurring item on the soundtrack is the anti-fascist Italian folksong, Bella Ciao, an anthem of freedom and resistance which two of the hijackers recite at length in one episode as a display of brotherhood. The link, therefore, between state largesse through paper money and fascism could not be clearer. In spite of its important message and its popularity, Money Heist is not, unfortunately, a particularly remarkable series from any other point of view. It takes an awful lot to fill fifteen, forty-minute episodes of printing money in the dull surroundings of what is basically a small, government factory. Some of the hijackers, such as the narrator of the series operating under the pseudonym “Tokyo”, seem to have been included more to provoke antagonism, in-fighting and daft sub-plots to keep viewers’ attention rather than because of any outstanding criminal talent. In fact, the plot drives one’s credulity to a nadir when “Tokyo” is offered to the police as a sacrificial lamb, proceeds to escape from their custody but then, for some reason, decides to return to the Mint on a motorcycle through the front door under a barrage of police fire, all of which happens to miss her. Another hijacker, “Berlin”, the group’s leader on the inside, is a bizarre concoction of character traits – brilliant tactician, cruel sadist and drawing, in alternation, either loyalty or repulsion from his team, while also finding time to fall in love with one of the hostages (oh, and he is also terminally ill with only months to live). Yet the character is portrayed in such a matter-of-fact manner that none of his deeper emotional dispositions regarding these aspects is ever really revealed. One ends up wishing that someone would just shoot him to put a stop to all of the needless aggravation he causes. It does not help also that the voices of the Spanish actors are overdubbed by Americans, most of whom sound either bland or, in the case of “Nairobi”, annoying. The original dialogue probably captured the pressures and anxieties of the characters a lot more convincingly. Finally, some of the more emotive, but inevitable love and death scenes that fill the time are drawn out to the point of tedium, while the romance between “The Professor” and the Inspector was predictable from their first meeting, albeit crucial to the plot. Having said that, Itziar Ituño manages to capture the balance between toughness and vulnerability rather well, and some of the hapless “Professor’s” improvisatory efforts to steer events in his preferred direction are both gripping and entertaining. Money Heist is, though, certainly in the “watchable” category, and we should surely pay attention to the fact that a series eliciting, quite explicitly, the criminal nature of state counterfeiting has become so popular. Let us hope that the theme of “sound” money, possibly the most critical element of a free society, receives more attention in future films and TV series.